As well as the Sandwich delivery service, we also provide a high quality catering service for all your office meetings and supply a wide selection of Sandwich Platters and Buffets. Wilphys also offer a complete outside catering service, buffets for weddings, funerals, christening and other important events. Wilphys Sandwich Bar and Cafe is Plymouth's newest and most exciting sandwich delivery service. We cover all areas of Plymouth, delivering a wide range of competitively priced and high quality Sandwiches, Salads and Snacks. You can order online and have your lunch delivered or relax and enjoy your lunch at Wilphys Sandwich Bar. 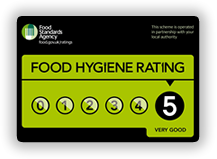 We are very proud of our 5 Rating from the Food Standards Agency.